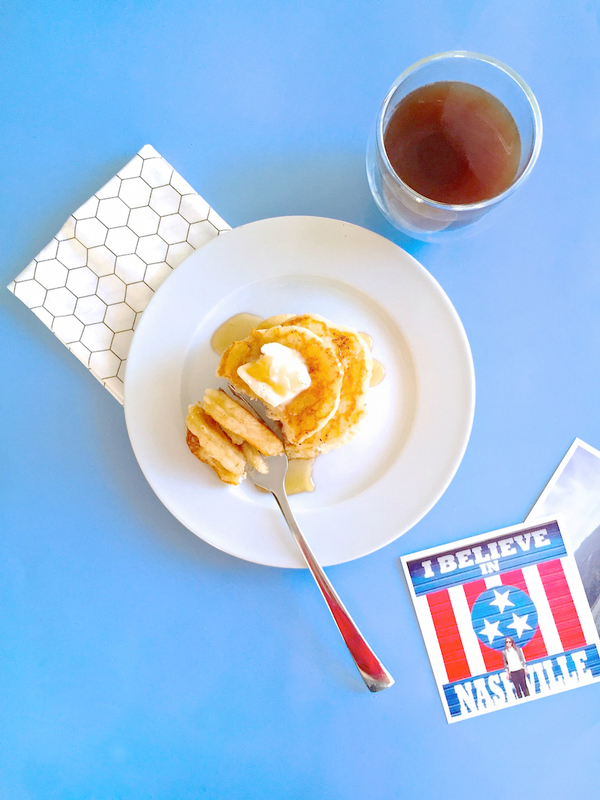 Warm Weekday Pancake Hack For Better, Yummier Mornings! / Hey, EEP! Warm Weekday Pancake Hack For Better, Yummier Mornings! Starting the morning with a warm breakfast makes any weekday better. But who has time? Not me. Fiancé makes the coffee, I just grab and go! So when I'm dying for pancakes, I make a big batch and freeze leftovers. Layered between parchment in a plastic bag, they'll freeze up to one month. 1. Whisk the flour, sugar, baking powder and salt in a large bowl. In another bowl, whisk the milk, yogurt, butter, egg and vanilla. 2. Pour the milk mixture into the flour mixture and stir until just combined (let there be lumps)! 3. Melt butter in a skillet until foaming. Spoon in batter and cook 1 to 2 minutes per side. Serve with lots of butter and syrup...or freeze between layers of parchment paper for up to 1 month. Omg, it's such a great idea to freeze them!